Richard MacRae, from Stapleford, has been named as the latest Chairman’s Community Hero by Nottinghamshire County Council Chairman Councillor Mrs Sue Saddington – her first award of its type since taking office in May. Among his achievements include helping local people with food and provisions from a local supermarket every week, helping reduce anti-social behaviour in the town and organising jobs fairs in the local community. He has supported residents with his own food bank which distributes food from a local supermarket and now he is being recognised for his community work by Nottinghamshire County Council. 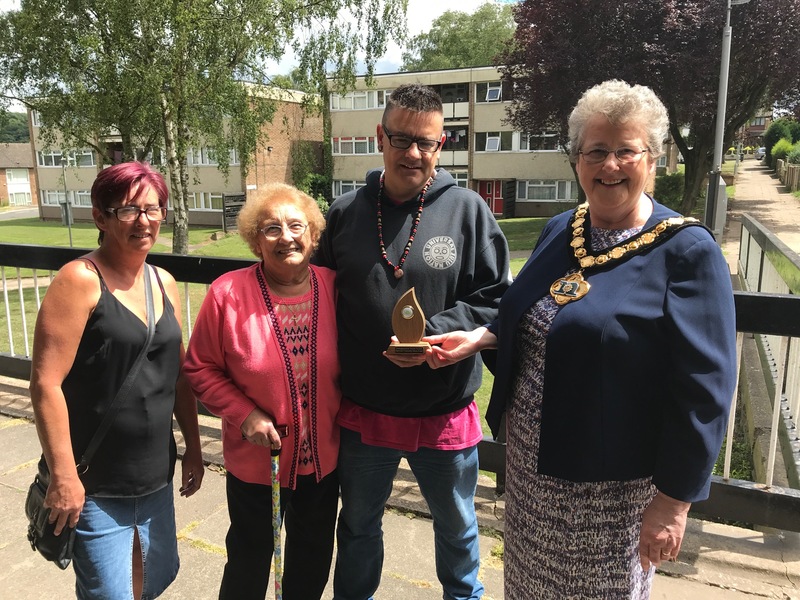 Richard MacRae, from Ilkeston Road, Stapleford, has been named as the latest Chairman’s Community Hero by county council Chairman Councillor Mrs Sue Saddington – her first award of its type since taking office in May. Nottinghamshire County Council recently launched its search for the Chairman’s Community Heroes, in order to celebrate and recognise the efforts of unsung community heroes who do outstanding work in their local area. Councillor Saddington had to choose from around a dozen nominees and was impressed by the efforts that Richard puts into his local community, as Chairman of the Stapleford Community Group. The Stapleford Community Group is an action group which meets regularly in different residents’ houses and is committed to improving life in the town. Richard was nominated for the award by Stapleford Community Group Secretary Donna MacRae. She said: “Richard runs Stapleford Community Group for which I am the Secretary. He collects surplus food from the supermarket and makes sure it goes to others which he has been doing for over a year now and which in turn has helped hundreds of people. He also worked with the local young people’s centre to invite the Chayah Development Group to come and talk to young people. The Chayah group was formed in 2012, by a group of young people and founder Hyacinth Francis who had had enough of the ‘street’ lifestyle, and is committed to making positive improvements in all aspects of their lives. Nottinghamshire County Council is still looking for community heroes. Some ideas for nominees are those who help vulnerable people with shopping, or providing a lift to a medical appointment, supporting young people in their community, or leading a local community project which has made a difference to people’s lives. Every two months, the Chairman of the County Council will select one person who they believe deserves an extra special thank you and will meet and receive the Chairman’s Award. The awards will be reviewed on a regular basis by the Chairman of the County Council and the Chairman’s award will be presented to a successful individual nominated for the award. To nominate someone, please visit: http://www.nottinghamshire.gov.uk/council-and-democracy/get-involved/nottinghamshire-community-heroes-award #nottsheroes on Twitter.